I have always wanted to own this gadget since last year. This is one in my wishlist for this year. 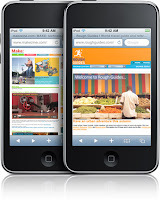 I hope I will be able to win a lottery or winin a raffle draw with this Ipod Touch as the prize. This has become my obsession since my laptop is so heavy for me to carry. I love its features as it has a computer performance and it is very handy to tag along. My niece has this gadget already. One day I am gonna own this stuff. Truly te, this is a great gadget I love itouch. very handy and all purpose. Mura na mana na to, bili ka na benta mo laptop mo. hehehe.May bago na pala ngayon Ipad" mas cool para nang notebook. me too I am dreaming to have one. I hope I can get it this year too. It is really a good stuff. But Maybe some people will choose iPad. But still I prefer the iPod.